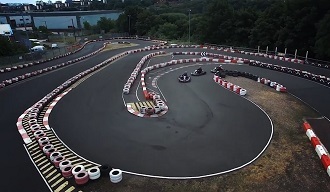 Parkwood Karting is ideal for small or large groups, corporate and client entertainment, stag and hen nights, team building exercises, fun days out and much more. The exhilarating 470 metre floodlit outdoor circuit can be used in wet or dry weather. The average lap time is 36 seconds in the dry. This compares favourably with shorter circuits, lap for lap you experience more time racing. Our fleet of BIZ 240cc karts have the potential to reach speeds of up to 50 MPH. The karts used at Parkwood are Biz JK2 Thunderkarts with Honda 270cc engines, Low level central fuel system, flip over pedal system, BIZ heavy duty steering wheel, Rear and side plastic protection, front deformable nose cone, Kelgate self adjusting hydraulic brake system fitted with 8mm disc with wiper groove and Mono aluminium wheels. Leave the A61 and cross the River Don into Neepsend Lane. Parkwood Road is approximately 200m on your left. Expert tuition for young drivers in kart handling and safety. Includes a full 15 minutes driving practice after the tuition session that can be accompanied by a parent or guardian.